The first thing that hits you is the style. The Acer Aspire 5600U is a slim machine that has more in common with a modern TV than a traditional PC. The screen measures 23 inches, has an HDMI input for your DVD player or games console and, crucially, looks great when playing HD content - whether that's an upscaled DVD or higher resolution movie downloads. The slick, all-in-one form factor extends beyond wedging all the hardware into the slim body - the touchscreen has a small bezel surround that extends beneath the screen itself to form an attractive plinth. The only downside is that the plinth design does limit your viewing angles slightly, but it's not a major setback for such an eye-catching design - one that could easily sit in your living room, home office or spare bedroom. The responsive touchscreen is well suited to Windows 8, and the wireless keyboard and mouse match the minimalist screen design to a tee. There are, however, more powerful desktop PCs available for the price, and the specification is more average than impressive. There's a DVD drive in place of a Blu-ray drive, 4GB of RAM and 500GB of storage, which is typical for an entry-level laptop. The i3 processor means that it's not really suitable for gaming, and it will struggle with any demanding creative apps. 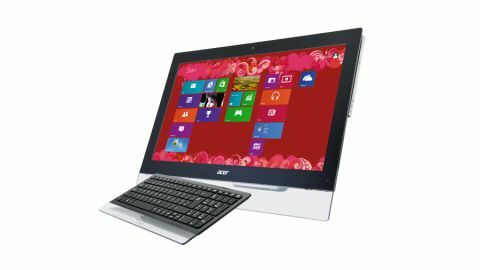 For general use - particularly web browsing, editing documents and viewing photos - it's a more than capable machine, and it's clear that Acer has pitched this machine at the family market. The screen will become a second room TV for many, and it's big enough for demanding home office apps. There are five USB ports, HDMI in and out, and a SD card slot to make importing your photos a breeze. If you want to slide the screen down, you can browse images or play touchscreen games at an almost flat angle, much like a giant tablet. The keyboard and mouse might be made of shiny black plastic, but they're well designed and feel nice and responsive in day-to-day use. If you're considering this PC for a home office, it's a good choice for daily tasks and the screen is a good size for editing your documents or images. If you're importing family video and expecting to edit your videos through a program like Adobe Premier Elements, you'll find the Acer struggles with its i3 processor - which is now an entry level chip against the more powerful i5 and i7 processors. Download a selection of large snaps from a DSLR camera and photo buffs will be disappointed with the 4GB of RAM you get for your money - but you won't notice if you're importing smaller snaps. However, at this price you would expect double the amount of RAM - 8GB rather than 4GB - alongside a Blu-ray player to make the most of the excellent screen. The storage options and hard drive are decent, though - 500GB is a standard size and is more than enough for family and professional needs in the home. The pay-off for the price tag is the design, and the Acer can quickly transform a spare room into a slick office or, similarly, go unnoticed as a small TV in the corner.